The standard surgical treatment for aortic regurgitation (AR) is aortic valve replacement. In the latest guidelines on valvular heart disease published in 2014 by the American Heart Association (AHA) and the American College of Cardiology (ACC) . However, in cases of AR caused by enlargement of the aortic root, it is stated that valve-sparing aortic root replacement can be one of the choices when the cusp configuration is maintained. In the guidelines released in 2017 by the European Society of Cardiology (ESC) and the European Association for Cardio-Thoracic Surgery (EACTS) , positive results were announced for aortic valvuloplasty performed at facilities with high experience [3–6]. 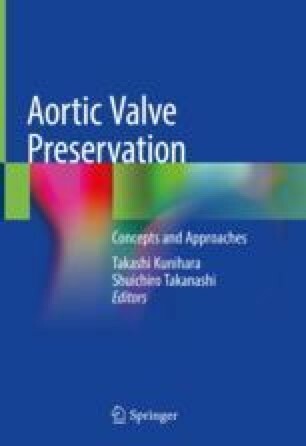 Although the number of aortic valvuloplasties has increased compared to that of aortic valve replacements, the guidelines state that aortic valve replacement is still the standard surgical treatment.